Quantum PR has delivered the first Business Forum for Maidstone Borough Council. More than 100 businesses from across Maidstone attended the first-of-its-kind event on Wednesday 5 December. Held at The Orangery, Turkey Mill and hosted by Maidstone Borough Council, the breakfast event brought together business people and entrepreneurs to share ideas, offer inspiration and learn about the Council’s plans to promote growth and regeneration in Maidstone. 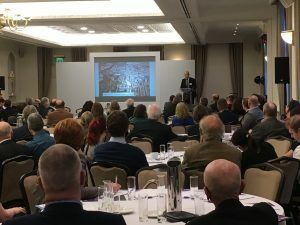 Speakers included renowned author, barrister and futurist Jamie Susskind, who delivered fascinating insights on the impact that technology and artificial intelligence will bring to our economy, society and political system, as well as presentations from local business leaders and Council officers. The event received fantastic feedback from the many local businesses that attended and the Council is now considering holding the event on a yearly basis.